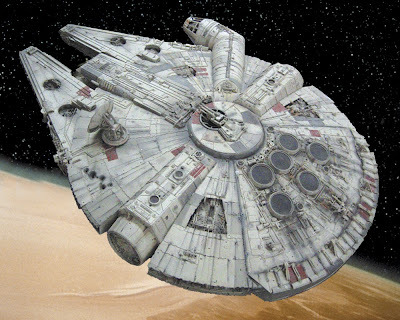 A dude named Chris Lee has assembled a crack team of volunteers to bring their collective hydrospanners together to build... a full-sized model of the Millennium Falcon from the Star Wars movies. From FullScaleFalcon.com, the official site of The Full Scale Millennium Falcon Project: "This is a quest to build the ultimate Star Wars prop: a 1:1 scale ESB/ANH hybrid Millennium Falcon with complete, correctly scaled interior. Yes, I have completely lost my mind, just like most of my friends and family say. Except for my close Star Wars fan friends, who say 'cool, can I help?'." Yes, the interior as well! Does that mean they've figured out what a "fresher" is supposed to look like?! We've already gotten to see the bathrooms in the Star Trek and Babylon 5 franchises: surely they have water closets in a galaxy far, far away too. Click on the link above for much more about this grand endeavor... which apparently, judging by the photos on the site, is already very well along!